Food not only satisfies hunger but also has a profound impact on our behavior and mood. 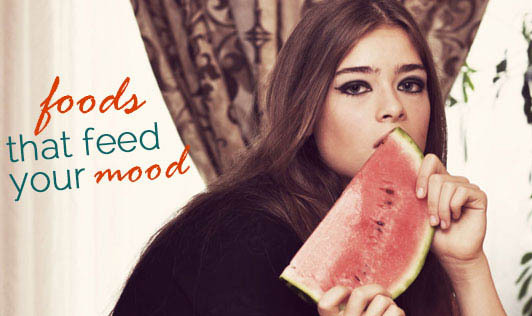 There are foods that can either boost or dampen your mood too. Though this might not sound true, here is something you should know. Eating certain foods can stimulate the production of neuro-transmitters-chemicals that pass information among cells in the brain. This process has an effect on your mood. Such neurotransmitters are chemicals that are manufactured from specific food components. Here is a list of such foods. Certain amino acids are known for their function in the manufacture of such neurotransmitters. Tryptophan, an amino acid is called the calming chemical, as it is converted to serotonin which calms your mood and frees you from stress. Tyrosine, also an amino acid, enlivens the brain making the person feel alert, helping him/her think and react quickly. As little as 10% proteins in a meal can block the brain from dulling effects. Apart from proteins, vitamins like thiamin, riboflavin, carotene and minerals like iron, zinc, and boron are important to keep the brain active. Foods like legumes, fruits, nuts, and green leafy vegetables are rich sources of vitamins and minerals. Such components in food too play a role in the synthesis of neurotransmitters. Thus, when you want to stay mentally alert, do not consume sweets, cakes, ice creams, sherbets, pasta, cereals or rice, as these can hamper the activity of your brain. Experts say the good bets are fish, meat (lean), milk, yoghurt, legumes, nuts, and egg whites. Caffeine is also one of the foods that is known to elevate the mood of an individual. Caffeine is the most widely used psycho-active drug in the world. It has tremendous mood-lifting powers. Caffeine is addictive and can have adverse effects when consumed in excess. Eating chillies gives you a thrill that is just sensory. The spicy capsicum "burns" the nerve endings of the tongue and mouth sending false pain signals to the brain. The brain secretes natural pain killers or endorphins - the feel good chemicals - that work like morphine and cause a temporary high. Sugar and meals rich in carbohydrates make you feel relaxed and act as sedatives. In some people, it may even cause drowsiness. Individuals over 40 appear to be more sensitive to the sedative effects of sugar. Lastly, you should know that no particular food can help you relax or increase your stress. This article is a collection of information from various research papers that talk about how food can affect your mood.